Hi, D here. In this blog, I will be uploading book reviews, readathon things, and a lot more bookish fun! Contact info and Review Requests! This tag was originally created by Okoto Oke Enigma on her lifestyle blog! 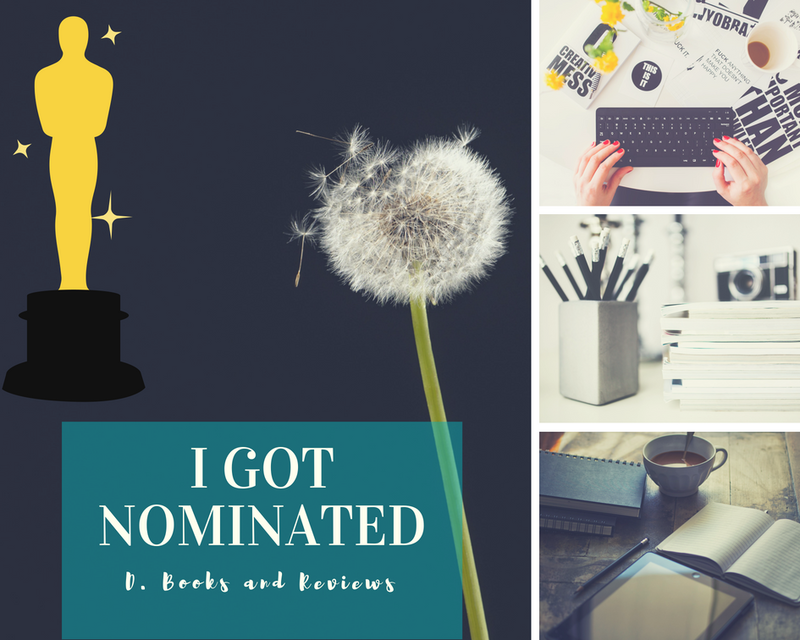 I got nominated by Noel over at Books with Noel! I am so thankful to have a popular online friend who can nominate me for such a crazy reward! Thank-you so MUCH! I would never have expected to have been nominated. I probably won't win but its worth a try! A. J. @ Read All The Things! Like I said, I don't know many blogs, but here are some that I think deserve the award. Neither. I don't drink caffeine, but I like frapaccinos. 2. What's your least favorite color? I don't know, maybe grey, but I like all colors! 4. If you could change places with one fictional character, who would it be? 5. What're some books that you've been really wanting to read in 2018? 1. How many signed books do you have? 2. What is your favorite book you have ever read? 3. Team Edward or Jacob? 4. Least favorite main character? I think my Ember in the Ashes review is one of my best posts. I love how I wrote this post! AND THE COLORS! It was really hard to choose which one though, but I still love this one! That is it for now! If you enjoyed, SUBSCRIBE to join the bookish fun! I (hopefully) upload every Tuesday, Wednesday, and Thursday (and I sometimes do surprise posts so Subscribe)! I have 4 signed books, I want Edward for Bella and Jacob for myself, I like funny books, and I have a list of favorite books- I love too many Lol! Least favorite main character would have to be Bella Swan from Twilight. Thank you so much for the nomination :D I'll answer these very soon! Hello! I interviewed some muggles and here are the answers. If you have read the Harry Potter books, what is your Hogwarts house? Are you going to try interviewing some muggles? Soccer is a sport. You use a ball and you can not use your hands. To try to get goals, you have to kick. What do you use for cleaning? If you had magic, what powers would you have? Have you read Harry Potter? What is a rubber duck? So that is it. If you enjoyed, SUBSCRIBE! Hey Everyone! I was contacted by the author to write a COMPLETELY HONEST review on his book, The Death Messenger! So here is the review! (No spoilers for this review at any point)! Synopsis (via Goodreads): "A message is delivered, the death answers his friend, both are connected." So my novel, Love and Theater. Here is the cover, synopsis, an aesthetic I made for the story, and another sneak peek to get you excited! Rose Adary is auditioning for the role of Anastasia in her school musical. When the nerve-wracking audition is over she accidentally trips and falls into the arms of Liam, the new handsome student at Banel Junior High School. Her well-organized lifestyle might as well have turned upside down when she discovers her mom is pregnant with twins and her little brother Al is in a car accident with his leg needing to be sawed off. Her feelings for Liam are just another problem. This story shows the family struggles that come from unfortunate accidents and the need to stay true to your family.